Early in the morning. An hospital office. Two doctors, exhausted, communicate the imminent death of a patient in the surgery room to his family. After a day of hard work, Physiology, or the whole of nature, has been over them, questioning the false expectations that, in not few occasions, overestimate the capabilities of their science. Nothing to blame. Only in their stomach that old bitter feeling of defeat, and any uncomfortable question, useless, about what they would change the next time. It is difficult to calm, even with years of experience, that unforgiving judge of their Ego, which improves them, but that torture with the own and fictitious failure. Now it´s time of the bitter moment to recognize in public a feared and cruel reality. Family, humbled, but contained, listen silently to their explanations. Technical language. “We tried anything… It was impossible… He did not respond”. They seem to understand. A daughter, nurse, asks if they can see him in the surgery room before disconnecting. – “It is not usual, nor convenient,” responds categorical one of the doctors. – “May I insist?. For me it is very important”, replies the daughter. The other doctor looks at her eyes. He perceives, as a lash, a deep but nor surly pain. A wrapped penalty of sweetnees and politeness, whom asks for something that is not in her hand to get. A dignified and strong pain, that only seeks a last handle to avoid tearing. A final grace which is more than a whim inconvenient. The farewell of whom, probably, was the lighthouse of her life. The first necessary step to resolve a long and hard grief. Moved by this, the doctor understand, that they cannot deny, hiding behind the usual cold, without incurring the greatest of cruelties. After convincing his fellow, even dubious, they access her request. They accompany the daughter, with slow pace, surrounded by a light white and spectral, that hurts the eyes after reflected in the metal doors of the surgery room. Silence is oppressive. A parade to nowhere. The daughter is close to the surgical table, and begins to whisper a few inaudible words for both doctors. They remain there, a prudent distance, to wonder if it is convenient. Perhaps they feel that, with their presence and respect in their eyes, they solemnity a depth ceremony that transcend and freeze them. They wonder what words she pronounces. How can be summarized a lifetime of memories, teachings, and tenderness in a few sentences?. Perhaps, as the doctor moved only told his mother in a similar situation, “Good trip, to wherever you go mom”. There are no tears, nor shaken by sobs, just a slow but continuous whisper of her lips, while she caresses his hair, with her face close to him. A kiss and she leaves saying to the doctor thank you that lights up her face and relaxes the two professionals, who have more than a knot in their throats. Her face seems relaxed, while the doctor recognizes a superhuman sense of worth, close to fainting. 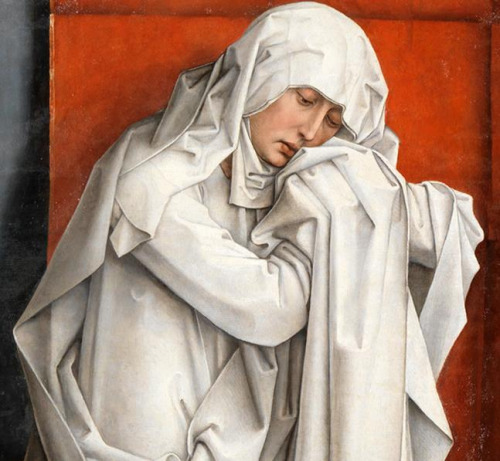 As the pale Virgin of Van der Weyden at the foot of the cross, whom the doctor moved admires. A fortitude, which seems to have been strengthened by those few seconds inside, but pain can explode with a little blow. A contention of who has been educated in love, but also in the face of adversity and in the discipline of acceptance. An hour later, the moved doctor goes to the waiting room to fill out the paperwork. His eyes crosses with the daughter´s. In the next second, she embraces him warmly, in a spontaneous and sincere impulse that surprised and embarrasses him at the same time, while he hears in a whisper “Thank you, I will not ever, ever forget what you have done for me this evening to let me say goodbye to my father”. On the strength of those arms that oppress him momentarily, he finally finds a sense of all the fatigue that invades him, after opposing many hours the inevitable. Because in this embrace, boils down the real reason that led him to become a doctor more than thirty years ago. If you can´t heal, comfort and accompany. He feels that by losing a life, his emotion, often neglected, has allowed him that other life can begin a grief without ballasts. He thinks, comforted in her arms, that he has created a lasting bond with someone admirable. He is who is grateful to her for giving him the opportunity to practise Medicine. With a capital letter.